Having a listen The Folk Ups will instantly have you making comparisons: Mazzy Star in an out-of-time Johnny Cash duet instantly springing to mind. Scratch beneath the surface though and one can observe the playful harmonic interplay, supplementing a narative backbone - that Simon & Garfunkel perfected - permeating The Folk Ups' wistfully melancholic music. But, such comparisons to great musical storytellers feel derivative and unfair. 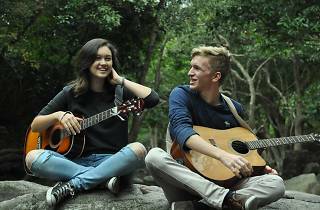 Ryan Harling and Jasmine Kelly - aka, The Folk Ups - belie their age with a maturity in songwriting and live performance that renders any comparisons moot. This is no tribute act. 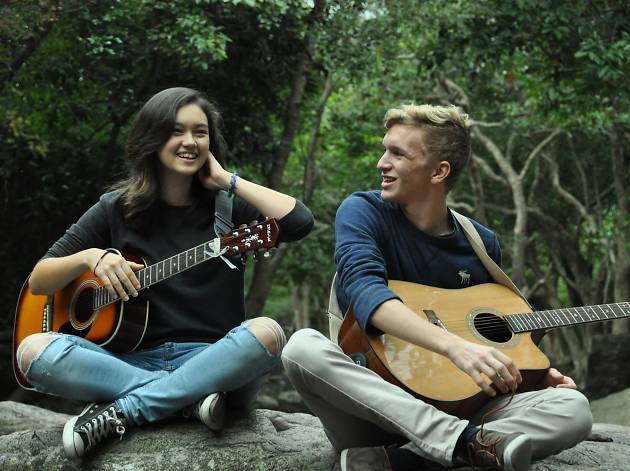 In fact, their latest EP, Shelby, has only reinforced the fact that The Folk Ups stand tall as one of Hong Kong's great English-singing acoustic hopes. Let's get know them a bit. We're all friends here. Our names are Ryan Harling and Jasmine Kelly. We started The Folk Ups in October of 2015! This was after jamming to our favorite song at the time, Little Talks by Of Monsters and Men. We then took things a step further, meeting up one day to write an original song that ended up as Red In The Sky, a murder ballad that featured on our debut, self-titled EP! Check out the tune's music video on YouTube [see below], which we spent almost 100 hours creating! We play a mixture of folk, indie and pop music. Our influences are all storytellers, The Lumineers, Of Monsters and Men and Bob Dylan, who we draw on sonically to get our own stories across. Where can people hear or buy your music? You can find our music on Spotify, iTunes, BandCamp and YouTube where you can download it all for free! We have two EPs titled The Folk Ups EP and Shelby, released late last year and the beginning of this month respectively.